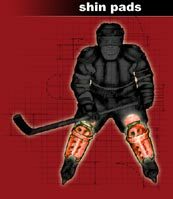 A player's kneecap should fit directly into the center of the kneecap cup of the shin pad. The shin pad should then extend down the full length of the lower leg. It's important to make sure the shin pad isn't too long. If so, the skate would push it up out of position. Youth: 8 ½" to 10 ½"